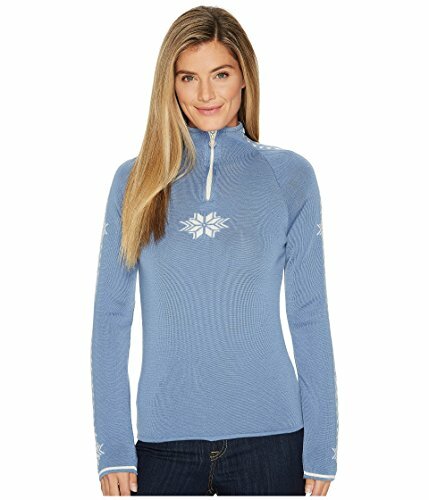 This Dale of Norway® Geilo Feminine Sweater travels easily from the slopes to the office and looks great every time. Fitted for a feminine silhouette. Lightweight one-ply yarn construction has been fabricated with durable combed Merino wool. Stylish rib knit sweater sports a pattern detail at arms and front chest. Sleeves constructed with dirt and soil repellant yarn. Stand collar sports fleeced lining. Half-zip front closure with metal logo pull-tab. Contrast long raglan sleeves. Straight hemline. 100% merino wool. Machine wash cold, reshape and dry flat. Made in Norway. Measurements: Length: 26 in Product measurements were taken using size SM (Women's 4-6). Please note that measurements may vary by size. Fitted for a feminine silhouette. Lightweight one-ply yarn construction has been fabricated with durable combed Merino wool. Stylish rib knit sweater sports a pattern detail at arms and front chest. Sleeves constructed with dirt and soil repellant yarn. Stand collar sports fleeced lining. Half-zip front closure with metal logo pull-tab. Contrast long raglan sleeves. Straight hemline. 100% merino wool. Machine wash cold, reshape and dry flat. Made in Norway. Measurements: Length: 26 in Product measurements were taken using size SM (Women's 4-6). Please note that measurements may vary by size. If you have any questions about this product by Dale of Norway, contact us by completing and submitting the form below. If you are looking for a specif part number, please include it with your message.